My empty wheelchair disappears behind me as I walk across the sports hall in my robotic legs. Dr. Neil Fleming monitors the electrical stimulation unit that is pushing current into my damaged spinal cord. And, Simon O’Donnell shadows me calling out the data from my heart rate monitor as I try to activate my paralysed muscles. The heart rate data is the only real time feedback that I have to tell me if I am engaging my muscles or not. I can’t see my legs because I am blind; I can’t feel my muscles because I am paralysed. But the data paints the picture of my performance. Without it, I simply have no idea if my effort is translating into action. With the magic number set for my heart rate at 130 beats per minute, I aim to hit that target during each 60 minute walking session. We set this heart rate after a blood lactate test in the university sports physiology lab. I aim by adjusting where I focus my effort, so, if I am only getting to 110 or 120 beats per minute I immediately know I have to do something different. The lack of feeling means that walking doesn’t just come naturally to me anymore. I have to try to artificially picture what is going on in my nervous system and legs to have the intention of connecting below my waist right down to my ankles and feet. And, the data seems to show that the Mark Pollock Trust funded team in Trinity College Dublin is making some progress. For me the data is the reward – it is as vital for me, as it is for an able-bodied athlete to keep paying attention to my training. 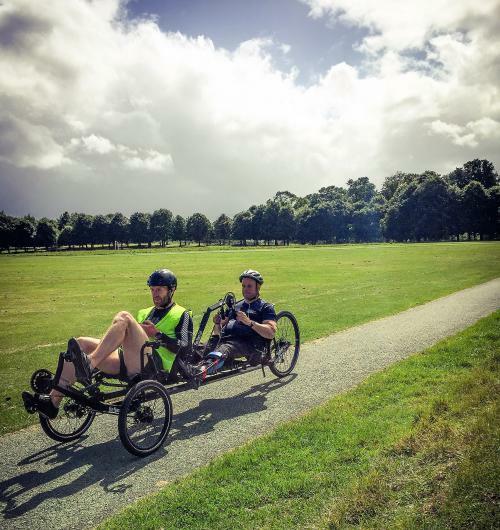 And, in the same way that the data informs my performance as we try to train for functional recovery after paralysis, it is data that is informing our performance out on my new #Smartbike tandem with Simon O’Donnell, my South Pole team-mate, as we prepare for the Giant’s Causeway Coast Sportive on 10th September. As scientist Neil says – the body is an integrated system and the muscle, fat, blood, bones, immune system, mental health, all of it plays a part in being an athlete. Since I broke my back 6 years ago my training has been really focussed on the paralysed part of my body. So, when the opportunity to get back out and compete, to get amongst it appeared in the guise of a Utah Trikes tandem and a CBS crew wanting to tell the story, I started to work my upper body and core and really quickly started to see the benefits of training my arms, to feel the spill over effect to all of my body and mind. Last Sunday, another person strolled ahead of us down the middle of the cycle lane with their earphones in. Like so many we’ve met on our cycles he remained completely oblivious to the 3.4 metres of aluminium tandem baring down upon him at 30 kilometres per hour. Like so many, he remained blissfully unaware of the 35 kilograms of frame, chains and cogs with a combined 160 kilograms of cyclists directed right at him. Despite Simon’s shouts of ‘coming through, coming through’ we again had to slow to a walking speed just shy of clipping the heels of the stroller. It was about 1 hour 15 mins into our training session. We had just finished our 3rd ‘Norwegian Pyramid’ and we were easing into our final one. A Norwegian Pyramid is a session developed by cross-country skiers in Norway to break up the monotony of endurance training. Each block of 5 minutes is set with different heart rate zones. For me, the target heart rates for each 5 minute block are 115, 125, 135, 125 and 115 beats per minute. The target cadence (the number of revolutions per minute of the pedals) is between 80 and 90, no matter what. And, the speed and distance is just a function of the target heart rate and the target cadence. While I was recording my report from the bike, Simon, sitting a couple of metres in front of me on our tandem, was selecting the gears and steering our way through the human traffic. As usual he was monitoring his own data on a Garmin Edge 1000 bike computer mounted beside my own Garmin 520 on his handle bars. Both of them connected to an array of sensors spitting out data on the cadence of our pedals, the power output in watts as well as our individual heart rates. But the problem was that I couldn’t read any of it due to the blindness. So, for the last few weeks, as we have powered through our Norwegian Pyramids, extended interval training and intense Fartlek sessions, Simon has been acting as my eyes relaying all of my data appearing on the screen in front of him. Just like when I train in my robotic legs, it is crucial for me to have the interaction of the different data points in real time. Too hard and I, like anyone training, rapidly become tired and underperform. Too easy and the body is never pushed hard enough to result in any training adaptation. It isn’t a problem when robotic walking because one of the lads can read out the data in real time, but on the bike it is different. The wind, traffic noise and volume of information required made it impractical to have Simon continuing to do the job. And, without the data I may as well stay in the support van with my feet up. But this weekend we finally solved the problem. Both bike computers remain on Simon’s handle bars. But, with the help of Irish Paralympic handbiker, Declan Slevin and Martin Gordon, a blind Irish Paracyclist, I have worked out how to convert my phone into a talking bike computer with audio announcements. This means that the technology talks to me now. On Sunday, throughout the Norwegian Pyramids, a Wahoo Fitness App on my phone announced heart rate, workout time, speed, cadence and power output every 30 seconds. This was all made possible with a little ANT+ Wahoo key adaptor for my Iphone to pick up the heart rate and power data along with a Wahoo cadence sensor attached to my hand cranks and a Wahoo speed sensor clipped to the hub of one of the front wheels of the bike. Now we truly have the #SmartBike that we set out to create with our friends and sponsors at ArrowElectronics and I am finally training again and getting really excited about the Giant’s Causeway Coast Sportive, a cycling event on Saturday 10th September. Please join us if you fancy a spin out, and tweet us, blog about this or share on Facebook using the #SmartBike and #TeamUnbreakable hashtags. We’ll be taking the #SmartBike out on my first sports challenge since breaking my back to the Giant’s Causeway Coast Sportive, a cycling event on Saturday 10th September with the option to ride 57km, 126km or 182km routes along Northern Ireland’s spectacular Causeway Coast. We’d love you to join us on #TeamUnbreakable. So, if you are up for the challenge go to www.markpollocktrust.org/teamunbreakable and sign up for £85/€100.